With a stunning victory in the Grade 1 Clark Handicap, Seeking the Soul became the second G1 winner for his sire, the veteran stallion Perfect Soul (by Sadler's Wells). 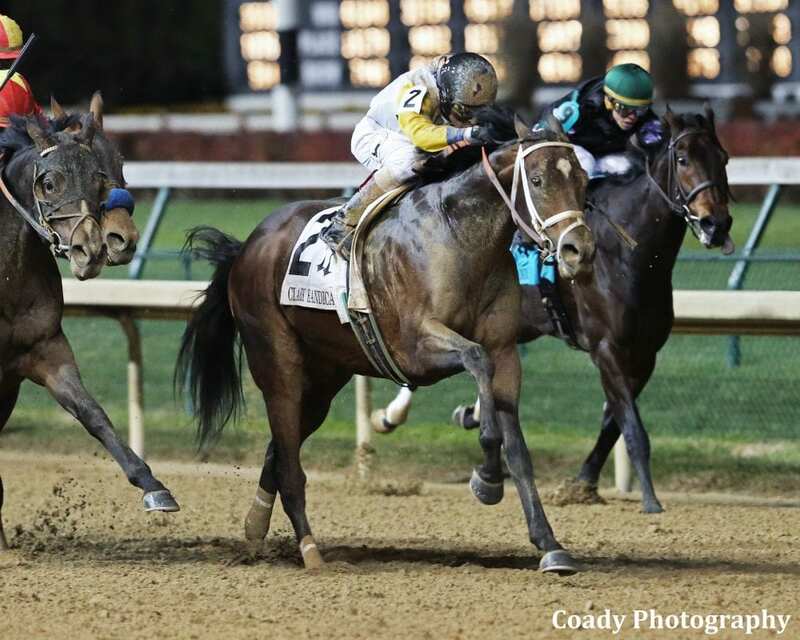 The stallion's previous winner at the premier level is Perfect Shirl, winner of the 2011 Breeders' Cup Filly & Mare Turf, and in an ironic turn of chance, both victories came at Churchill Downs. In addition to this pair, Perfect Soul is the sire of Golden Soul, who was second in the 2013 Kentucky Derby behind Orb, and of Perfect Timber, who was second in the G1 Northern Dancer at Woodbine. Bred and raced by Canadian precious minerals tycoon Charles Fipke, like his sire, Seeking the Soul is out of the Seeking the Gold mare Seeking the Title, a granddaughter of the great racemare and producer Personal Ensign. Sid Fernando, president of Werk Thoroughbred Consultants and an adviser to Fipke, recalled the circumstances that led to the production of the Clark winner's dam. The mare produced Seeking the Title the following year, but the result was not what one would hope from such an expensive purchase. The breeder's enterprise was well rewarded. As a 3-year-old, Seeking the Title won the G3 Iowa Oaks, and she finished third in the G1 Gazelle Stakes at Belmont Park later that year. The athletic bay had proved her class, and Fipke brought her home to be a broodmare. And then bred his G3 winner from one of the great producing families in the stud book to his home stallion Perfect Soul. There was, however, a reason for this. Fipke said, “We found, eh, that Perfect Soul works best when you have La Troienne in the family, as well as Mr. Prospector, and in the case of Seeking the Soul, he has them both.” This was the pedigree pattern that Fipke was seeking in making out the mating that produced the Clark Handicap winner, and there's more. That match has certainly paid off for Fipke, and Seeking the Soul is the second foal out of Seeking the Title. The 2-year-old full brother is the mare's third and is named Perfect Seeker. Seeking the Title is back in foal to Perfect Soul for 2018. So why would Fipke use the horse? There are several reasons. One is that Perfect Soul had a high-class race record, becoming a champion turf performer in Canada and a G1 winner the States as a 5-year-old, and the horse has a very good pedigree, being by European supersire Sadler's Wells and out of a daughter of Secretariat. Another important reason is that Fipke employs this approach because he can. Fernando explained: “Mr. Fipke plans his matings and spends a lot of time on them, and the entire process related to that gives him great pleasure. He is, in many ways, a throwback to the great owner-breeders from the middle of the past century because he derives the greatest satisfaction from breeding his own mares to his own stallions and looking at this as a competitive enterprise. As a result, he is constantly seeking homebred colts that may become stallions for his breeding program. That's an understatement. There might be five similar breeders in Europe and the States, or perhaps not so many. Also, Fipke stood Perfect Soul's full brother, unraced Not Impossible, in Canada, and that horse became the first Sadler's Wells stallion to sire a North American classic winner with the Queen's Plate winner Not Bourbon, who also is a stallion in Canada. Fernando recalled that Fipke chose to stand Not Impossible due to the circumstance of Viceregal and Vice Regent, both bred by E.P. Taylor in Canada and sent to stud at his Windfields. Whereas Viceregal was a divisional champion in his homeland, Vice Regent was lightly raced and not a stakes winner, but a better specimen and became a high-class sire, numbering champion and leading sire Deputy Minister among his numerous good offspring. Using that example as his model, Fipke got a Canadian classic winner from Not Impossible and came close to getting an American classic winner from Perfect Soul. With Seeking the Soul, Fipke has an improving 4-year-old with the potential to challenge the divisional leaders and may do exactly that in the Pegasus World Cup next year. This entry was posted in Bloodlines, Bloodstock, NL Article and tagged Bloodlines, Breeding, charles fipke, Frank Mitchell, pedigrees, perfect soul, seeking the soul, Sid Fernando, sires, Thoroughbred breeding, thoroughbred pedigrees, Thoroughbred sires by Frank Mitchell. Bookmark the permalink.